How do Review Sites Make Money? I’ll Show You. I’ve actually been engaged in making my own review sites for years and many of them have actually made money and still do today, including the following one. There’s actually a NUMBER of ways any page can monetize by simply reviewing some of the most popular products on the market. 1) Firstly, we can all agree that no matter what the subject (well the popular ones), there’s countless products on the market available. Take fitness equipment for instance. You’re bound to find so many machines, supplements, juices, workout programs, you name it, that are available for people in this market. Or how about any type of computer, phone, phone accessory, ect…, there’s just so many products. I can write several books on all the products available and I doubt I’d even hit 1% of all the products available in this world and the beauty is that this list is growing, because companies and people are inventing and releasing new products, with the goal to solve problems. 2) Second, while there are countless products available, very few become extremely popular and viral. These are the ones which explode with sales and make the most money. I happen to have an example of such a thing, where a viral diet broke out in popularity and made me nearly $200k, because I reviewed it on a site I used to own. Read about that here and how I made the money from that. 3) Third, with the mass amounts of products available out there, a huge chunk of people who hear about it through marketing go online and look for REVIEWS of these things and find them on blogs like mine. 1) It’s never ending because products are constantly being released for countless markets, so a person who chooses to start a review site has a plethora of ideas on which product to choose to cover. 2) You can make some seriously good money if you are in this business and like I said I will be showing you how, but if you’re anxious, read about this program which teaches you how to establish blogs that review products to make money from them. 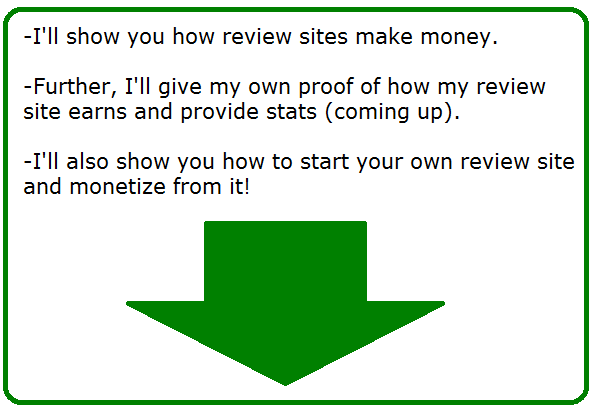 Ok, so what are the exact ways review sites make money? 1) The page runs ads, and gets paid for each click. Pages can choose to serve ads on themselves from companies who are ready to pay them for each click. Even Google itself runs a program called Adsense where they do this and yes, that means Google can pay you to run their ads. This is a method that works better for pages that get a lot of visitors, so a good way to make this work would be to create as many product reviews as you can to attract the most amount of people. More people landing on the page = more people potentially clicking the ads = more money made by the page owner. 2) The page runs ads, but the ad company pays for every visitor. This is actually a better way to make money because here you get paid for every single visitor that hits your page. Now Adsense won’t produce this type of opportunity, but places like Mediavine will. They are a company that pays page owners GOOD money for each visitor that lands on the page. The important quota one needs to meet in order to be eligible to work with Mediavine is to have a website that gets at least 25,000 visitors to their site, ORGANICALLY, meaning from search engines. Read more here. I have friends who blog about products on their site that have Mediavine running ads on it that get paid $1,000’s every single month from it. 3) The page sells products as a middleman. Affiliate marketing is an awesome business model if you know how to make it work and it really comes down to having a site that manages to get tons of visitors to it that need to buy something to solve a problem. Suppose a blog goes over a fitness product that aims to get people six pack abs and the person who covers the blog, explains how they used the said product and got so and so results in so and so weeks, whilst showing pictures for proof and evidence that it works. Throughout this blog post, that person places links to the same product so visitors can buy it too and if they do, the blog owner will make the commission. That’s really one of the best ways to describe how the affiliate marketing process works and the other beauty of this option is that you as an affiliate can choose to promote any product you wish, in most cases, for free. It’s very freelance if you want to call it that. The really hard part of this though is knowing the keys to getting the laser targeted visitors to your page, the ones which are most likely to buy that is. 4) The page sells it’s own services or products. Many review sites like to attract visitors that are interested in a particular product, but then end up funneling those visitors to their own services. If a page goes over fitness programs, and gets people interested in them on it, they can sell their own fitness product to that audience. 5) A combo of the above things. Generally speaking, combining different methods of monetization for a page is not a smart move because sometimes this ends up cannibalizing the profits of a page, but when one intelligently, it can work. One of the friends I told you about above who runs Mediavine ads on his site, ALSO practices affiliate marketing and he literally told me, doing this combination of things had NO NEGATIVE impact on sales, in fact the opposite happened. The first thing you actually need is a blog. Why? Because that is the place where the reviews you choose to write will be covered. The second thing you need is to choose a topic. It is very much recommended that you choose a specific topic and cover the specific topic’s products that are available in that market, and those which you know a lot about. The best pages that cover products generally come from people who know a ton about what they are covering. The third thing you’ll need is to find a list of products to cover. Since they come out frequently, your goal is to spot the newest products in your market and cover them on your blog. My advice would be to bookmark popular pages that cover the products you also wish to cover and this will allow you to piggyback off the trending products that are selling hot. If you’re in the internet marketing topic, I’d suggest Muncheye. There’s other places and blogs too, but that will be a great start. If you’re into fitness, pages like Beach Body and blogs that cover these topics are also great starting points. Those are 2 examples, but you can see they can give a newbie blogger plenty of products to review. Blogging about the most popular products is how you get your page out there, to be found by Google and then rewarding your blogging efforts by sending that page traffic. From there, the 5 options of how to monetize from the products you’re covering comes into the picture! The fourth thing is to figure out how to best monetize from the page. To be honest, figuring this part out is the easiest, because you have so many options to choose from, and you can switch at any point (or combine ideas like I showed earlier), that it’s not much of a loss if you choose incorrectly, you can always switch it up and start earning more. What does absolutely matter is that you get to blogging about the products to get the visitors, to make the money. 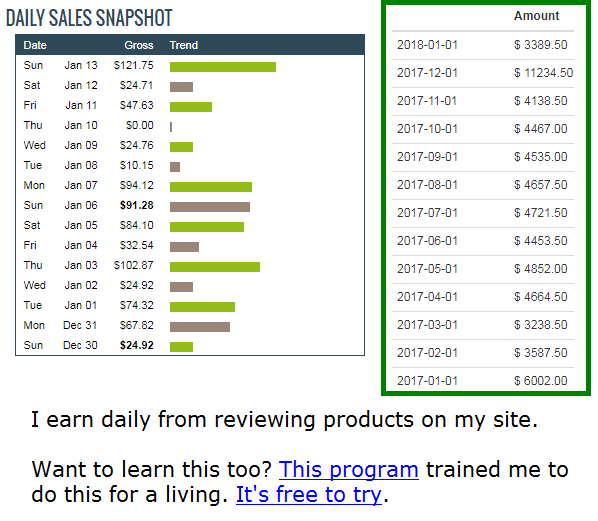 Want a step-by-step plan that’ll teach you how to earn from this? One of the best places to learn this art is from Wealthy Affiliate which actually helped me become a blogger who earns money from the reviews he writes and it will teach you the same things. If you have any questions on how review pages make money or have some personal ideas you’d like to check on with me before you start, ask below :)! I do so agree with you that review sites can and do make money, but I am really impressed with the success you have had – you are the living proof that everything you have written about really does work. You have some great tips, and everyone who is or who would like to be involved in Affiliate marketing will get great help from those tips. I had never heard of Mediavine, but I will certainly be investigating that now. And of course I agree with you that Wealthy Affiliate is by far the very best place to learn all that you need to know about Online and Affiliate Marketing. It is really difficult to start such a business from scratch without really knowing the correct way to go about it, and Wealthy Affiliate helps so much with that, and also helps its members to avoid expensive mistakes. Thank you so much for your inspiring and informative post. Just had a good munch through your site. I am new to affiliate marketing, so I am constantly on the lookout for advice backed up by experience. You have given me a plethora of both. I have added your page to a folder I have on my desktop, just for the good stuff. Now I can drop in, on here, whenever I want to refresh my approach and keep ahead of the game. Really good advice that was easy to follow. Massive thank you. I’m thinking of starting a review type of web site too, and it will be on the make money online niche. I am very impressed to how much success this web site of yours has achieved, even though the design and look of this web site is overly simplistic. This may be because you have a good site architecture through internal links and of course, your site is quite old. Do you think I can make it too in this game? If I review opportunities and point people to Wealthy Affiliate like you do here, what is the chance I can compete with sites like yours? Hi Gom, I have included a link to an article that talks about the very same thing you asked, which was competing against my website in this same niche, please check that out. You also have to understand that reviewing products is one part of the goal, the other is to actually provide an awesome review. That is something you need to be able to do if you’re going to sell it or Wealthy Affiliate. This is a great exposition as to how review sites earn. I am thrilled and pleased to have stumbled upon this today. I have learned so many things from this article. I now understand something I was in the dark about for a long time. I now know that a page can run ads, and get paid for each click or that the page can run ads and the company ca pay for every visitor. With all this new knowledge gained, I am already considering getting a review site. Cheers. Thank you for this wonderful article. I normally used to wonder how review sites really make their money and now I have learnt so. The funny thing about this is that some of them don’t even run ads on their sites probably because there are some other ways they can monetize their sites. Well there’s more ways to monetize sites aside from running ads and affiliate marketing, as well as selling their own products are legitimate ways to also do that. I actually wrote a list of options website owners can choose from when it comes to monetization. Your article is very useful, especially to online affiliate marketers like me. I have a blog on sports and I was wondering if you had any advice on products to review for that? I read your article and get a lot of ideas about online marketing, which is very useful for me. 1) While sports itself is very broad and not something I’d recommend affiliate marketers make a blog on (it’s not specific enough), you can still make this work by reviewing the top trends in sports news, like covering events taking place. The point is, you want to cover the most popular topics to get ranked for them on Google and then rake in traffic. From there, if you can get to over 900 or even 1,000 visits a day, signing up with Mediavine to have them pay you to run their ads would probably make you several $1,000 a month from just that. 2) The other option is to narrow down your sports blog to something very specific. Say a blog about boxing techniques, MMA gear, teaching people how to ski, that sort of thing, basically narrowing things down to one specific sport, not all sports entirely and then reviewing popular products and writing how to articles on the chosen sport. I explain this in this blog, but this route would allow you to make more sales through affiliate marketing as it would bring in more targeted traffic to your blog. Thank you. I have been thinking of doing a review site, but don’t have much experience with a lot of products. Is there a way to write reviews without having used a product? Is there a way to get products to review for sites? I have a blog on diabetes and I was wondering if you had any recommendations on products to review for that? I really can’t review the different types of insulin! I was thinking maybe some weight loss ideas because there is a lot of evidence that shows type 2 diabetes can be “reversed” with weight loss. I am a huge fan of Wealthy Affiliate by the way. It is where I am learning many things about affiliate marketing. 1) It’s a grey area when it comes to writing reviews on things you don’t own or try. The best way to make sure it’s ethical is to mention that you didn’t try it, but also mention why you are someone people should listen to. What I mean specifically is that when you know a niche very well, you will be able to grade many products just based on their labels. In my case, I have a lot of internet marketing experience and I have tried MANY different products and spent a lot of money on them. There are times when I am presented with a new product to review that is either too expensive or it’s just so clearly low quality or just very transparent, that based on those parameters, that I can grade it on that. I can see what the sales page says and cross reference that with my experiences and make a grade based on that. My example should help you with your diabetes site where you can review products and also take other people’s reviews and cite them (paraphrase). That’s another tip. 2) You can sometimes buy products and review them (I do this a lot) and you will also find that as your site grows and reaches more people, that you will naturally get more people and companies reaching out to you and trying to get you to try and recommend their products. I’d be careful with this in the case of diabetes. I usually just buy a product so I have no requirement to write a positive review when it shouldn’t be positive. 3) Regarding products for your diabetes site, you should obviously be doing more than just talking about insulin. There’s diets specifically designed to lower blood sugar, topics which talk about diabetes and lowering it as well as supplements and vitamins of all sorts, also designed to help people with this condition that you can review. I am certain if you look for these topics on Google, on say forums and Amazon, and see products for people with diabetes, you will have a PLETHORA of blogging ideas to work with. I also have a post here that talks about what to blog about that is specifically related to your niche. This is the first time I am getting to know the major reasons why there are so many review sites. 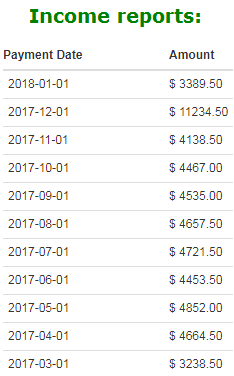 I also have a review site but I have not been making money from it. I must tell you your blog post is an eye opener for me and I will make sure that I implement all you have written in this article. Thanks for these insightful tips.